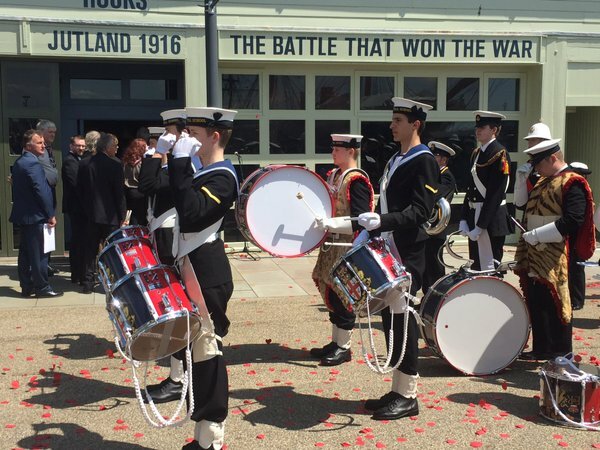 Tomorrow (Tuesday 31 May) sees the 100th anniversary of the Battle of Jutland, the most significant and largest sea engagement of World War I. 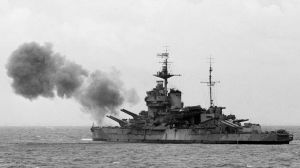 It was also the last ever encounter between two full fleets of battleships, the Royal Navy with 26 and nine battle cruisers and the German Imperial Navy's High Seas Fleet comprising 22 battleships and five battle cruisers. 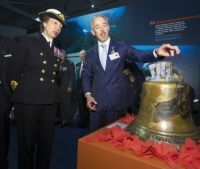 A major exhibition has opened at Portsmouth Historic Dockyard, a significant addition to what is already one of the country’s leading historical visitor’s attractions. In all, 250 ships took part in the encounter, the British losses in men (6,000) and ships twice that of the Germans but as one New York newspaper put it “the German navy has assaulted its jailer but is still in jail”. 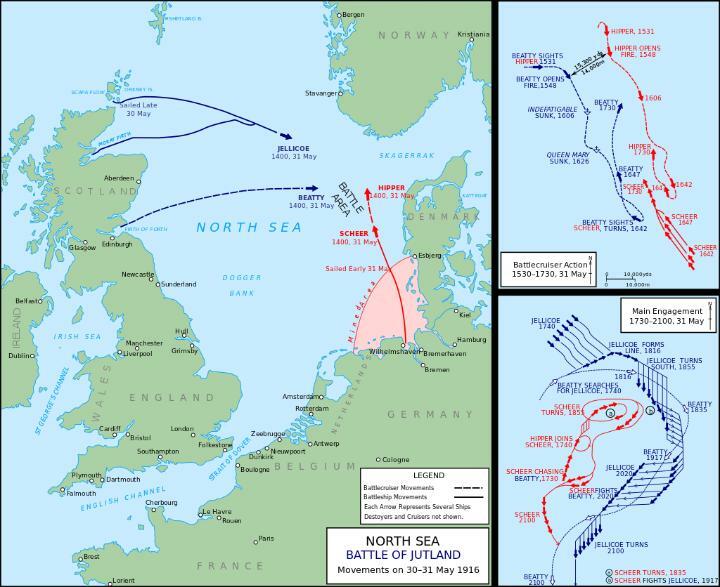 The battle was the outcome of German Admiral Sheer’s plan to lure the British fleet into the North Sea and its destruction. While the numbers cannot be compared with those of the Somme, which followed shortly afterwards, the fact is that Jutland marked the turning point in the war, Germany virtually under siege from that point onwards, not self-sufficient in the materials of war, nor in the basic essentials of life for the civil community. The High Seas Fleet never went to sea again. Its crews mutinied in October 1918, leading to the Kaiser’s abdication and the end of the war. The final ignominy was the scuttling of the whole fleet when interned at Scapa Flow in the Orkneys, the home of the Grand Fleet, in June 1919. The various galleries and exhibitions take visitors through the build-up to the battle from the time of the launch of Dreadnought, the first modern battleship in 1906, to Warspite and her sister ships which would take part in World War II as well. The Kaiser’s Germany tried to out-build the British shipyards. It failed. The encounter itself is described in some detail, with a film mock-up of what was probably the first use of aircraft in a sea battle, a Shorts 184 floatplane acting as a spotter. Radio communications were in their infancy, which affected both commanders and their manoeuvring decisions. The tactics used by the Royal Navy were those of Trafalgar 100 years earlier, including flag signals! With all the smoke from the ships and the gunfire, these could not be seen properly. The general gloom of the North Sea did not help either. The first shots were fired just before 16:00 and with the gathering dusk it was all over soon after 20:00. No radar in those days. The German fleet escaped more by luck than judgement, crossing astern of the British line as it raced to its Wilhelmshaven base. As well as seeing live-action depictions of the epic battle, visitors can read first-hand accounts of those who witnessed the action. Among them are extracts from a diary of Queen Alexandra’s Royal Naval Nursing Service nurse Mary Clark, who tells of her service as a naval sister in the Grand Fleet hospital ship Plassy. Also featured is a lifebelt belonging to William Loftus Jones VC, commander of HMS Shark, which sank during the battle. His body was washed ashore in western Sweden. There is also a photograph of Shark survivors. Elsewhere is a large gun from German destroyer B98 and two smaller deck guns from HMS Opal and HMS Narbourgh. HMS New Zealand, a battle cruiser, took part in the fight. The ship was paid for as a gift from the Dominion in 1909. On display is a traditional Maori skirt which was worn by Captain Lionel Halsey, commanding officer, during the battle. It is on loan from the Canterbury Museum in Christchurch. Perhaps the most poignant item on display is a piece of memorabilia linked to but not part of the Battle of Jutland. In 2015, Microsoft co-founder Paul Allen deployed his luxury 414ft luxury yacht Octopus and a custom-built submersible for the successful removal of the ship’s bell from HMS Hood, the wreck discovered in the Straits of Denmark between Greenland and Iceland. At Jutland, three British battle cruisers literally exploded, including Invincible, commanded by Rear Admiral Horace Hood, killing all but six of the 1,026 crew. In 1918, Hood's widow was asked to launch the ill-fated battlecruiser HMS Hood, named after his ancestor the First Viscount Hood, a mentor of Nelson. The lessons of Jutland were not properly implemented with “The Mighty Hood” also disintegrating when shelled by the German battleship Bismarck in 1941. 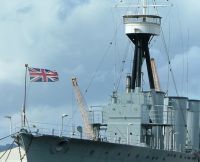 Called “36 Hours – The Battle that won the war”, the exhibition is an addition (with a special fee) to the Portsmouth Historic Dockyard, which includes HMS Victory, HMS Warrior, the Mary Rose and the Royal Navy Submarine Museum, Gosport. Entry includes a one-hour harbour boat tour and the ferry to see the submarine at Gosport. To capture properly all that is on offer at what is officially the National Museum of the Royal Navy is really a two-day/overnight exercise. It is as massive site. Very close by is Gunwharf Quays, an outlet retail destination with 90 outlet stores and 30 restaurants, bars and cafés and the landmark Spinnaker Tower. In times gone by, cannons, ammunition and other armaments were stored in this area. It is all part of Portsmouth’s heritage.